Most prospective student-athletes who go on a visit don't come with nearly enough questions to ask. Here are some questions you may want to think about asking. The previous article in this series was devoted to learning something about the personality traits of the coach you'd be working under. The questions in this article aren't aimed at revealing personality traits (though, in a few cases, they might reveal something of interest about the coach's personality), but are designed to help you better understand what to expect once you arrive on campus the fall of your senior year. I've tried to identify those questions that are particular to specific event areas, but most of these questions are applicable across the board. Pick those that work for you. Hold a few more in store that might work for you. Discard the ones that don't work for you. And understand that when you come in on a visit, the prospective coach wants you to leave with no question you might have unanswered. So, while you probably don't want to ask questions non-stop from the time you arrive to the time you leave, it's more difficult than you think to ask too many questions. 1. I've heard that there are elevated academic expectations and special study sessions for varsity athletes at many schools. Can you tell me what the expectations and any extra forms of assistance for athletes look like at your school? 2. When does practice begin in the fall and what does a typical week of fall practice look like? This question wouldn't apply to distance runners as distance runners will likely arrive before school starts (that's certainly fair territory to ask about if you are a distance runner, however). But, throwers, sprinters, and such will typically have practices in the fall. 3. If there's a class I need that is only offered during the regularly-scheduled practice time, how do we handle that situation? 4. Do athletes at this school have any priority in scheduling of classes? What do I need to do to ensure that I'm able to take full advantage of that provision? 5. Do you routinely redshirt athletes according to a plan or do you typically plan to save the redshirt season for later in case of an injury? 6. What would my team and practice responsibilities look like during a redshirt season? How do I make arrangements to compete during a redshirt season if I'm not injured? 7. What meets do you typically travel greater distances for? What does the schedule for travel for those meets look like? 8. What level of the team do I need to reach to make the travel squad for those kind of meets? 9. What is your philosophy with respect to the indoor track and field season? 10. Where do your distance runners do their training? What sort of surfaces would I be training on? Maybe even ask to see a trail or two that they use. Some training, of course, will be on the track, but a substantial share of the training--and the amount varies by program--will be done off the track as well. If you hate running on city streets and sidewalks and that's where they do their off-track training, that's information you want to know. 11. What portion of the training for cross country/indoor track/outdoor track is done on/off the track? 12. Can you show me what a typical week of midseason training looks like for a freshman? How is that different when I get to be a junior or a senior? 13. How much weight room work is there in your program? What does it entail, and when is that work done? 14. What is the typical progression of performances for an athlete who sticks with your program through all four or five years of college? 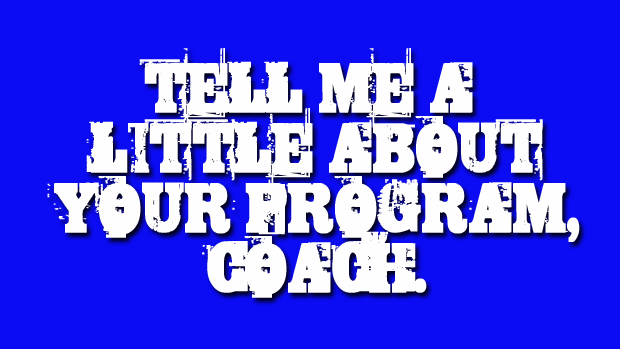 If the coach is playing straight up with you, the answer will involve a range and not a fixed number. The simple fact of the matter is that the range, and not a spot value, is what's typical. Some athletes progress more than others, even within the best of programs. If you get a fixed number, it's likely an estimate for those who have progressed the most in the program. 15. How do you determine what event(s) I will be training for? 16. Will I be housed with another athlete from the team when I come in for my freshman year of college? 17. What are the most common challenges that your freshman athletes report with respect to dorm life? 18. Does the athletic training staff work with any modalities such as ART (Active Release Techniques) and MAT (Muscle Activation Techniques)? Don't raise this question if you don't know what they are. 19. What personal qualities define the best athletes you've ever coached? Listen closely to the answer to this one and evaluate yourself honestly here. If your personal qualities aren't a reasonable match here, you and this coach may have trouble later on seeing eye-to-eye. 20. What percent of the athletes that start out in your event area end up competing all four or five years through college? You're looking for an answer here that matches well with the attrition estimate you found when you did some homework on your own (see the preceding article in this series) to investigate this very question. It doesn't have to be a perfect match, but it should reflect both candor and awareness on the part of the coach. 21. If I'm an athlete in your program and your event area, what can I expect from you on a daily, or near daily, basis? 22. Why should I choose your program over other programs? Be sure to look the coach straight in the eye when you ask a question like these last two. I've placed them at the end of this list because they should be among the last questions you ask. Another question you may consider asking concerns what assurance(s) the coach can give you to believe he/she will be there through the course of your college career. As a general rule, younger coaches tend to move around more than older coaches. Someone who has 20 years of service in at a state school isn't likely to be heading anywhere due to how public employee retirement systems work. Your biggest concern with coaches in that category might be whether they'll retire before you're done, but it's unlikely they'll move to another school. It is unlikely in the extreme that a coach considering a move to another program is going to drop a hint to you that a move is imminent, but listen closely to see if their rationale for why they're sticking around makes sense. Make good, consistent eye contact throughout the discussion of this question if you ask it. If, at the end of that discussion, you're not convinced the coach is staying put, definitely take that into consideration as you make your decision. That said, you can still be misled. It goes with the territory. Maintaining eye contact is a good thing to do throughout the discussion of any question you ask, but the more important the question, the more important maintaining eye contact becomes.